The photos are well on their way to being organized. I love the size of these library albums, which are about the dimensions of a large hardback book. Our old collection never fit on a standard size shelf. I also found two handmade British silk ties for 25 cents apiece as an additional Father's Day gift. Now the pressure's off! Were you REALLY posting at 4:23am? Yikes! Your albums are beautiful! Who makes them? I'd love to find some! Thanks. I think we might hit Sam's Club next weekend -- they're going on my list. I cannot believe how much your blog is inspiring me! 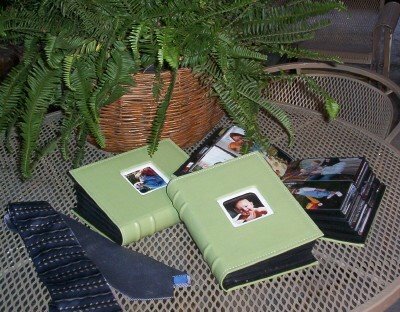 Those are wonderful photo albums and what a bargain you got on those ties! I found your blog about a week ago and read through all the archives. It is so inspiring! I just love the way you take care of your family and home in such a beautiful way on a budget.